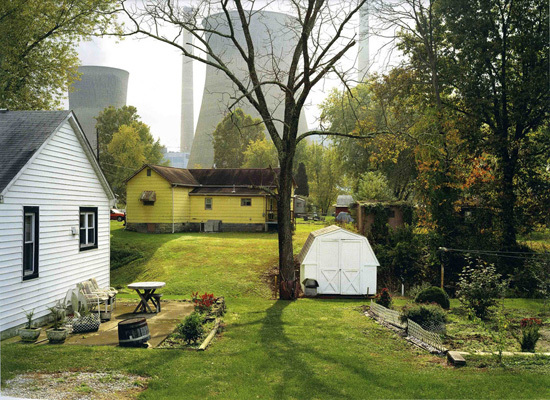 The Amos Power Plant in Raymond, West Virginia, as seen from an ordinary backyard, and as photographed by Mitch Epstein, who coincidentally is part of ecotopia, the 2nd ICP Triennial of Photography and Video. The exhibition ends 7 January 2007. Those not living or traveling to New York before then are fortunate in that some of the artists have their own website. For instance, Mary Mattingly, featured earlier here in this post -- her entire line of post-apocalypse haute couture, New Time timepieces, and wearable homes are online. Catherine Chalmers' cockroaches and genetically engineered mice are here. Simon Norfolk is here. And there's also this post. Harri Kallio's flock of dodos are nesting here. Sam Easterson's animal and vegetable videos, which I once mistook to be part of an extensive surveillance network in the American West monitoring the mental condition of reclusive landart artists and alerting the Army Corps of Engineers whenever their earth moving activities compromise the tectonic integrity of Nevada -- well, a handful of them are here. As for the others, a search through artnet should suffice. Hopefully, fellow bloggers will start downloading some of these photographs, and create their own personal surveys of ecotopias for everyone to view for free. After all, an admission price of $12 is obscenely extravagant; the best things in life should be free. Bombast. Nice word choice. It's been a long time since I've heard it, and can think of several opportunities for deployment. Just a little side note: Mary Mattingly is not haute couture. There is a list of 13 designers that are considered haute, legally (there is a long list of requirements you have to satisfy). Her stuff is amazing though.